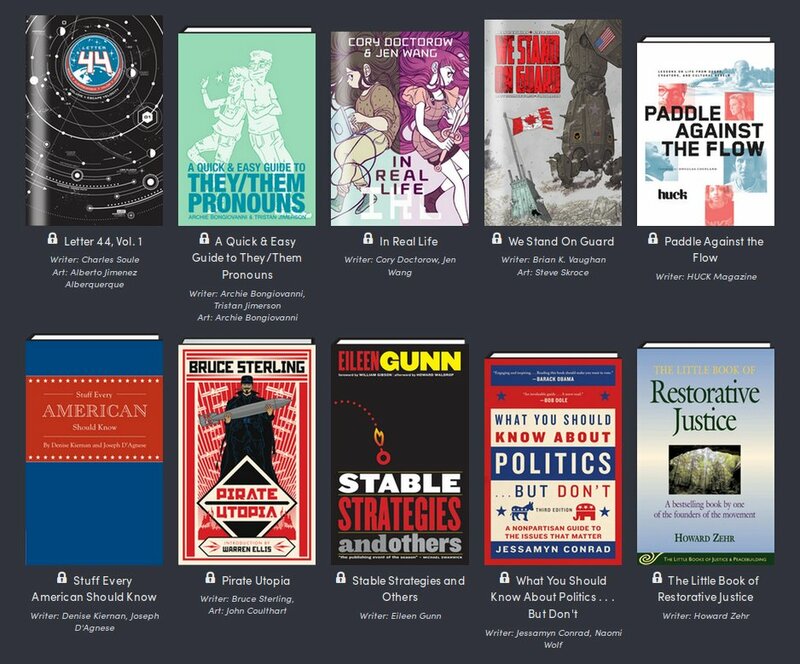 The latest Humble Bundle features up to 26 DRM-free ebooks (including In Real Life, the graphic novel Jen Wang and I created) at prices ranging from $1 (for 8 titles) to $18 (for all 26), with all proceeds to the ACLU to benefit voting rights litigation and action. Eat, sleep, read, resist. Join Chronicle Books, Image Comics, Lonely Planet, Cory Doctorow, and other great publishers and creators in support of a more perfect union! Get a bundle of ebooks on volunteerism and positive resistance, a zombie survival guide, tons of comics – plus the exclusive debut of science fiction anthology RESIST! Every cent of your purchase will support the ACLU in their fight for voting rights, free speech, LGBTQ rights, and more. Irresistible? We think so. Pay what you want. All together, these comics and ebooks would cost over $358. Here at Humble Bundle, you choose the price and increase your contribution to upgrade your bundle! This bundle has a minimum $1 purchase. Read them anywhere. These books and comics are all available in PDF format; every title except In Real Life and American Presidents is available in ePUB format as well. Many are also in CBZ or MOBI too. Instructions and a list of recommended reading programs can be found here. Support charity. 100% of the proceeds go to the American Civil Liberties Union via the PayPal Giving Fund.